All I needed to hear to want to read this book was "Bonnie and Clyde meets If I Stay"...Say no more! 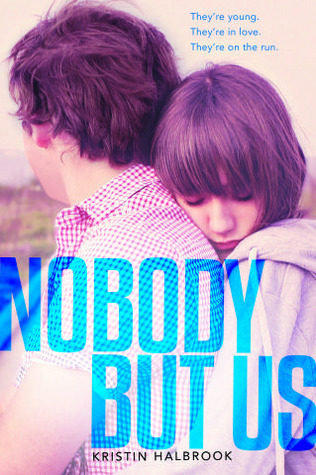 2013 has just kicked off with some Epic novels and Nobody But Us definitely joins the group! This book was utterly unputdownable! Let me just rave about the writing; The author executed this novel perfectly! I loved her writing style! It contributed to the overall reading experience of this novel. It was simple, yet provided so much energy. She definitely entered the YA scene with a bang! The first half of the novel is character development. Introducing Zoe and Will and their tragic back stories. I fought back tears during the first half of the novel. However the second half was a completely different story! Aside from flying through the pages with my heart pounding through my chest, I couldn't find back the tears. AND THAT ENDING!! Really?! Kristin Halbrook definitely gets points for the jaw-dropping factor! Nobody But Us goes down in debut history in my books! Heartbreaking and beautifully written! Wow, looks like you really loved this book! I've seen some reviews for it where people only liked it, but I think it looks good. Great writing is always a plus, and shocking endings are awesome. Great review! Woh! I have been seeing some really negative reviews of this book, which made me sad because I love the cover and wanted the story to live up to it. So glad you enjoyed it! This book was definitely emotional for me-a really powerful read. I am very excited to find out what else Halbrook has up her sleeve! Tea Time with book boys! The Crazy Bookworm is out Sick! Corded Cover Reveal and Giveaway!